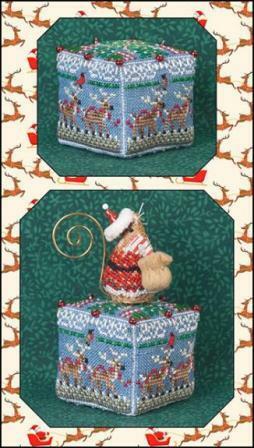 It’s the perfect little perch for Gingerbread Santa Mouse! Up on the roof top Santa’s 8 reindeer wait, ready to carry him off into the night. 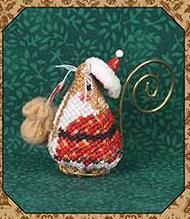 Tiny cardinals and robins (stitched over 1) perch on the antlers and gold bells on the red reins glisten. Fir trees and peppermint sticks decorate the top of the cube with snowflakes and holly on the bottom. Two colors of bugle beads accent the stitching. Stitched on 32 CT Weeks Dye Works Sky Linen with DMC and Kreinik #4 Braid in color 002. Overall design measures 7 ¼” X 5 ½”. Each side of the finished cube measures 1 ¾”. Included with the leaflet are silver crystal and matte green bugle beads, 8 large red beads to pin to the top seams and easy finishing instructions. Stitcher will need fusible interfacing, stuffing and straight pins.